Were you on Team Atari or Team Intellivision in the 80s? There were other home gaming consoles on the market at this time, but it seems these two companies were the main contenders battling it out in ads and commercials. Like so many other kids, I had an Atari 2600. My best friend from the time had Intellivision. I only remember playing it a couple of times at her house and to be honest, I recall not being terribly impressed. Sure, it had the "better" graphics compared to Atari (which sounds hilarious now considering how far gaming technology has come) but the selection of available games fell short compared to the list Atari eventually accumulated and licensed. The flat controller with its keypad was cumbersome for someone used to Atari's joystick. The Atari 2600 was released in 1977, and quickly became a popular gaming system. Intellivision was developed by Mattel in 1979 and was marketed as "intelligent television." 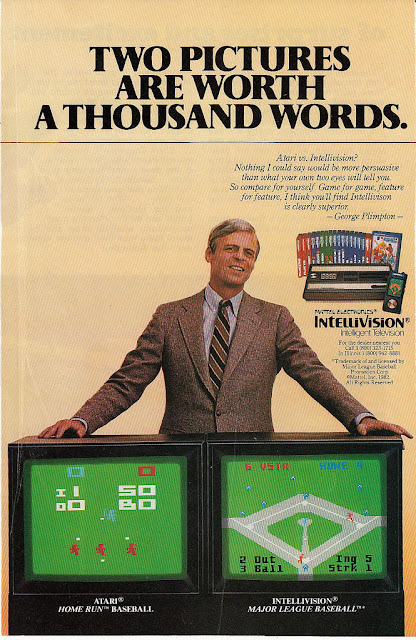 They got writer George Plimpton--an odd choice for a spokesman, since most kids didn't know who he was--to star in a series of snooty ads and TV commercials explaining why Intellivision trumped the Atari 2600. This one starring Henry Thomas from E.T. is weird--Henry is starstruck by "Mr. Intellivision" and it is ironic considering the E.T. video game was developed for Atari. Mattel got into hot water when they started to build up hype by hinting at a new accessory for Intellivision which it called a "Keyboard Component." This was a piece of technology with extra RAM that your Intellivision would be inserted into, turning the whole system into a personal home computer. The Keyboard Component became a marketing disaster, getting delayed several times so that engineers could resolve its reliability problems and make it cheaper to produce. When Jay Leno performed at Mattel's Christmas party in 1981, one of his jokes was, "You know what the three big lies are, don't you? 'The check is in the mail,' 'I'll respect you in the morning,' and 'The Keyboard will be out in spring.'" Things got so bad that the FTC accused Mattel of fraud and false advertising, and ordered the company to pay a fine of $10,000 daily until the system upgrade was widely available in retail stores. By the fall of 1982, Intellivision officially canceled the Keyboard Component. Intellivision would release new versions and variations of its system but in my opinion, it never cemented itself into pop culture notoriety like the Atari 2600 did. Which one did you own--or like the best? Et is widely considered the worst video game of all time, although I kind of remember playing Raiders of the Lost Ark and couldn't stop getting attacked by a moose, no matter what I did with the joystick. I think we're the only family that didn't have an Atari 2600 (but for some reason we had a few of the cartridges). We had a Coleco-Vision & I THINK you could play Atari games on it as well. I agree with Keir, that Henry Thomas commercial--"My name?" Well kid, my parents wouldn't have had a clue who you were either! Atari 2600 by a mile! The first game I got addicted to was of course, Pac Man. Followed by Donkey Kong, Pitfall, and Berzerk. I had the dreaded ET game. Mom thought we would want it when she saw it on sale at JCPenney. I got so upset about it , I threw it out the window after trying to get ET out of the pit for 35 minutes. I don't think I was alone. Mom got upset, but she only spent $3 for it. I STILL have my Atari and just played Video Pinball on it not that long ago. I never played Intellivision, and I only vaguely remember it. The Atari 2600 was way cool at the time, but a gal friend of mine who was hooked on, what, the commercial Centipede game, commented when I showed her the 2600 version "Oh, it doesn't look very good". In the late 80s, early 90s I spent a lot of time archaeo-technology spelunking around Silicon Valley; Mecca was the old Atari buildings, where it all started. I still own the 400, 800, and XL Atari computers and hundreds of games (much more advanced than the VCS). But those games still have good gaming, fun value! I owned an Atari 2600, but I came into that fairly late in the game around 1982 when my mother finally took pity on me. I have to admit, the Intellivision commercials intimidated me a bit -- what if I was playing a sub par system? The Atari brand cartridges were so expensive, I was forced to buy the offbrand ones, some of which were craptacular. However, Kaybee sold the Imagine cartridges at a reasonable price and some of those titles were pretty good such as Atlantis, Dragonfire, Demon Attack and possibly my favorite game Cosmic Ark. Found my way here while doing a Google image search for "kids playing Atari." I totally remember that ad. Anyways, it was team Atari 1000% for me. I still have my original Atari VCS CX2600A which my dad got for me in 1981 for $139. I actually introduced it to my kid a couple of years ago and he totally digs it, still asking for it by name in the midst of the hyper-reality of Xbox 360 (that's my boy!). Not to harp on the Intellivision though; my best friend had it back then and we had a lot of fun playing it. Their Triple-Action biplane game absolutely blew Atari's Combat out of the sky, and Discs of Tron was awesome too. But the intuitive simplicity of Atari was unmatched, from its sleek design to the large amount of games. Intellivision did indeed have better graphics, but it just wasn't as easy to use. Atari 2600 by a country mile. Sure, Intellivision had 2 extra years of evolution and RAM behind it (mostly squandered by utilizing cheap Texas Instruments chips), which allowed it to use character-mapped graphics that could occasionally best the Atari version of an arcade port. 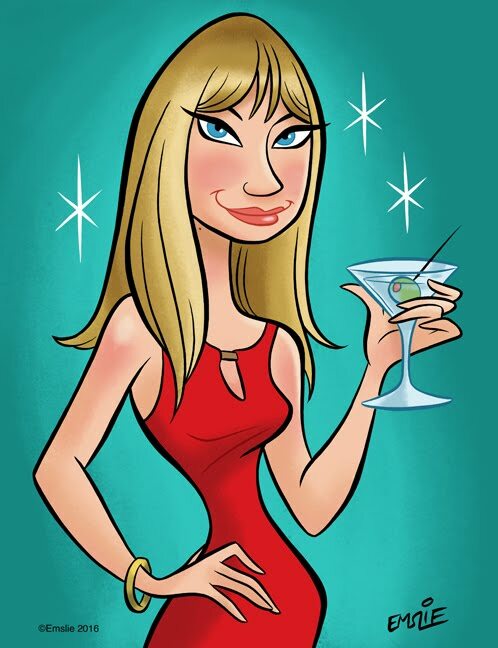 But those character graphics were often clunky, uncolorful, and jerkily-moving affairs. Meanwhile the Atari's usage of the TV's 192 scanlines and 128 colors, along with various programming tricks, allowed it to steadily advance in game quality and smooth playability over the years. Then there's the paddle/driving controllers... reason alone to own an Atari to this very day. No emulator will 100% capture the lag-free smooth performance of an Atari/paddle/CRT combination. Nearly every paddle/driving controller game is worth playing, though the represent a small percentage of the total catalog.. at least until you dig into the homebrew scene. Yes, Atari games are still being made to this day ;). And those Inty controllers? My god were they bad, WHEN they worked at least. In fact, you can barely find a working vintage one in the wild these days. The consoles themselves are also mostly broken. Yet original Atari consoles (in all their glorious iterations) rarely have issues. Game, set, match.